President Benigno Aquino III on Monday signed into law a landmark measure offering compensation to victims of human rights violations under Martial Law. 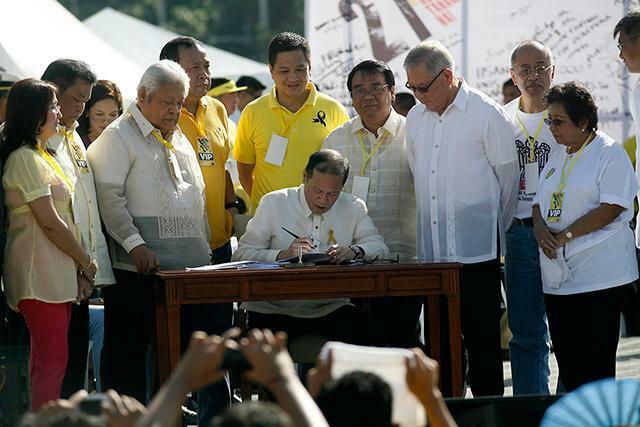 Aquino signed the Human Rights Victims Reparation and Recognition Act of 2013 during the 27th anniversary of the EDSA-1 revolt at the People Power Monument in Quezon City. “Nilagdaan natin ang Human Rights Victims Reparation and Recognition Act of 2013 bilang pagkilala sa pagdurusang dinaanan ng napakarami sa batas militar,” he said during his speech at the rites. Earlier, Aquino himself had said he and his family underwent suffering during Martial Law, when his late father, former Sen. Benigno Aquino Jr., was incarcerated. He recalled his late mother Corazon and sisters were searched when they would visit his late father. Aquino thanked Senate President Juan Ponce Enrile and House Speaker Feliciano Belmonte Jr., as well as the bill’s authors, for their support in passing the measure. The commission will work with the Department of Education and the Commission on Higher Education “to educate young people about the abuses committed by the Marcos regime and the heroism by those who opposed it,” a Palace statement said. “As we mark the 27th anniversary of the bloodless revolution that toppled a tyrant and restored our freedom, it remains our responsibility to remind the present and future generation that the freedoms they enjoy came from the selfless sacrifice of nameless Filipinos who struggled against tyranny and oppression. These are the nameless heroes who faced the armed might of the State and suffered torture, indignity and even death,” he said. “I am confident that the future generation of Filipinos will always value, cherish and protect the freedoms that we reclaimed 27 years ago,” he said. “We can and we must transcend our differences in order to make the Revolution’s promise of shared prosperity a reality for the Filipino people,” he said.